How can I restore power after a switch was shorted with scissors? Only possible answer: Fess up to your parents. And make sure you're very, very sorry when you do. They will be angry with you, and rightly so. You're worried about what damage you've done to the socket and the house wiring, and that certainly is an issue. That's why fessing up is the right thing to do, because the black marks round the socket suggest your house wiring didn't have proper protection on it, and it all needs checking. If it isn't checked, this could result in a house fire and your entire family dying. (This is NOT an exaggeration - house fires are the reason we have electrical safety codes.) We've already established that you aren't safe around mains electricity, so really don't try flipping breakers or anything. If the house is still being built, it shouldn't be a major issue to get this sorted. But more than that, you've been stupid enough to put your life in danger, and you are really lucky to still be alive. This will freak your parents out. Brace yourself for some grief, driven by the fact that they're relieved you're still alive. Be glad you're still alive. Even if the scissors have plastic handles, that tiny bit of plastic may not provide sufficient isolation to prevent current flowing through you. You're still alive. You're lucky. If the scissors are still in contact with the light switch, knock them loose with something non-conducting, such as wood or plastic. A stick will do, but it should be larger than a popsicle stick or a pencil. While it is likely that a breaker has been tripped and there no longer is any current running through that switch, you don't know for sure. You survived, so stay alive. Only now you go look for the circuit breaker that likely has been tripped. Don't touch anything yet, just check if you can see which one it is. 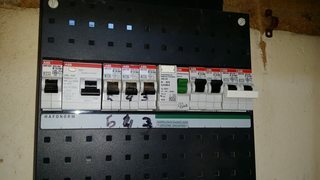 Only if you can find the one breaker that has tripped, restore power to that circuit. But since you're in a house that's still under construction, other circuits may have been switched off. You do not want to switch those on. Most modern circuit breakers look like switches, sometimes with a two-piece switch (more on those later) but old fuses look like a small round window. Fuses. The left one has popped. Your fuse box may look like this. If so, look for the one that has popped. 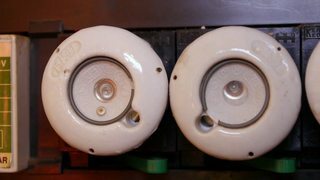 The small metal circle in the middle of the fuse will be missing. Sometimes it will be visible, as in this image. You will need to unscrew its housing, find one of the same amperage, replace it and screw it back in. Breakers. Up is on, down is off. If your breakers have a two-part switch, you will see one with a small part of the switch down, while the rest of the switch is still up. If you find more than one switch in this position, keep your hands off because you don't know which one has tripped. If they're one part switches, the entire switch will be down. There may be a "trip" position that's different from "off". Again, if you find more than one switch down, don't touch them, since you don't know why they're down. Only if you can find the one switch that has tripped, you can switch it back on. Now check if the lights are back on. If they're still off, switch that circuit back off. I can understand why you might think this optional, but you need to tell. The switch needs to be checked for damage and replaced if needed. Better tell now than have the house burn down later.